Went just on the west side of the wall on Fippy server. Killed roamers as fast as I could, and got one to spawn within 5 mins and dropped my first hair, second spawned 4 mins after that and didnt drop hair, and third was 6 mins after that and dropped the second hair. If your having trouble finding the giant wood spiders, just kill roamers on the west side of the wall until they spawn. Rare spawns and even more rare drops! Four complaints about the rare spawn in a month's period, and I gotta add another. I have a 14 year old Halfling Druid that is still trying to complete his silly newbie armor quest! For the past week and a half I have showed up in MT, SoW'd myself, and ran around for 4 - 6 hours. The wood spiders seem to spawn 2 an hour. I haven't been able to find any place holders but it is possible that they are on a spawn table because when there's more people in the area killing other things I see about 4 an hour. The frustrating thing is I started looking for 2 Giant Wood Spider Hairs to make some silly Moss Toe Boots almost two weeks ago. I ran through the big wall and first thing I saw was a Giant Wood Spider...killed it, and it dropped the hair. I thought, "This will be EASY"! Two weeks later I'm still sending /ooc's left and right telling people I'll pay them if they find that silly hair. Now that I've invested so much time in silly newbie armor quest I just must have it, even though if I would have spent my time in Kurns or at derv camps I would be able to buy better boots anyway. Grrrrrr! I think I will /petition and see if they intentionally lowered the spawns of these spiders or if it was an accident. RE: Rare spawns and even more rare drops! Please let me know what the result of your petition is...i'm having the same problem with those "silly moss toe boots"
Hey A weird one for you. If you can't find the femur or Thorax, head to Everfrost. The spiderlings there drop Giant Wood spider Femurs and Throaxes. I scored all three parts in about 3 min. just take the PoK book from Misty to PoK then down to Halas. I didn't even leave sight of the PoK book there. 6 kills all three parts in about 3 min. Go figure. RE: Hey A weird one for you. I've been killing wooly spiderlings all morning based on your suggestion and haven't seen any wood spider parts. So they must have fixed it. 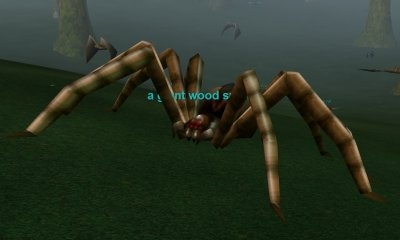 Has anyone else noticed that since the last patch, Giant wood spiders seem to have become much more rare? Up until about a week ago, I could run out past the wall in MT and kill 15-20 of them in a couple of hours, but now I'm lucky to see two of them in an entire night...I also noticed that there seem to be ALOT more rats out there than there used to be...Do they have to be killed now to make the Giant wood spiders spawn now? This is driving me nuts...I only need one patella to finish my newbie armor quest! Yes, I have also noticed that it takes forever to find these guys, I'm going to put in a bug report, hoping they can look into it for a future patch. I believe one very recent patch dealt with a spawn in another zone so that it wouldn't be quite so rare. These guys are easy until their cute little healer comes along. Tehre are about 3 spawn places in the canyon connecting warslisk woods to field of bone where these might spawna nd can be conveiently hunted. I had no problem with my lvl 21 druid. You migh want to ahve tracking to find them, because there are lots of trees there and they are quite hard to see. Spawn time is longer than I would have liked but hunting solo there (with medding breaks) was alright. Some other goblin types also spawn there but at lvl 21 I did not encounter a red one. With a caster yes these wold be easy with my twinked monk not so easy, hits for 46 sometimes and alot of dual 25s even with mend at 105 and using it i still had to fd and run. I have over 450ac and dual fighting batons and he still beat me senseless.